Published: Feb. 4, 2018 at 10:19 p.m. Updated: March 29, 2018 at 08:33 p.m.
Nick Foles' remarkable rise to the pinnacle of football earned him two trophies on Sunday night. The Philadelphia Eagles quarterback, who was considering walking away from professional football just last offseason, won the Super Bowl Most Valuable Player award after leading Philly past the New England Patriots, 41-33, in Super Bowl LII. Foles' miraculous underdog story reached its conclusion at U.S. Bank Stadium in Minneapolis, where the journeyman quarterback threw for 373 yards and three touchdowns and even caught a score in the upset win. The first quarterback to lead the Eagles to a Super Bowl title, Foles made history in more ways than one, also becoming the first player to throw and catch a touchdown in the same game in Super Bowl history. "We have such a great group of guys, such a great coaching staff. We felt confident coming in and we just went out there and played football," the underdog Foles told NBC's Dan Patrick immediately after the win. "We've played this game since we were little kids. We've dreamed about this moment. There's plenty of kids watching this game right now dreaming about this moment that someday will be here. To be here with my daughter, my wife, my family, my teammates, this city, I'm very blessed." Foles' journey to the Super Bowl podium was a long one. Drafted by Andy Reid's Eagles in 2012, Foles started 24 games in Philly over the span of three seasons. During his historic 2013 season, Foles put up a still unmatched 27:2 TD-INT ratio and a league-best 119.2 QB rating. But within one season, Foles was benched by Chip Kelly and then shipped off to the St. Louis Rams, where he languished for one season under Jeff Fisher. After an offseason of contemplation and one year in Kansas City, Foles returned to Philadelphia this season on a two-year deal to back up the franchise quarterback Carson Wentz. But when Wentz suffered a season-ending ACL injury in Week 14, Foles was thrust into the spotlight, and Philadelphia was written off. Despite concerns over Foles' ability to perform in big games, Eagles coach and former backup quarterback Doug Pederson trusted in his journeyman signal-caller throughout the postseason and into the Super Bowl. "We just wanted to stay aggressive. We mixed in some of the RPOs [run-pass options]. The Patriots did a great job of kind of nullifying some of that," Pederson said of his game plan heading into Super Bowl LII. "Listen, my mentality was I'm going to stay aggressive with Nick and let him use his playmakers to make plays." 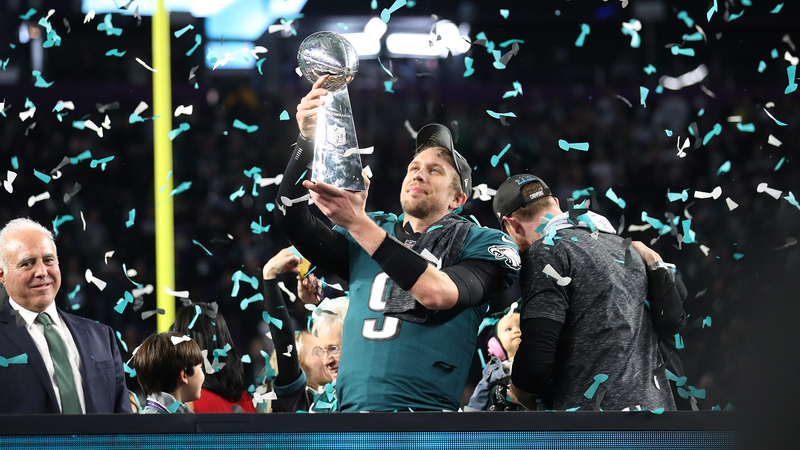 Foles closed the season with two poor performances, but turned it on in the postseason, leading Philly to three straight wins and its first Super Bowl title. Showcasing a brilliant deep ball and uncanny pocket presence, Foles finished the 2017 postseason with 971 passing yards, six passing TDs and just one interception. What the future holds for Foles is unknown. Wentz is on track to return from his ACL injury and reclaim his place under center as Philly's franchise quarterback. Foles is under contract for one more season in Philadelphia, but after his heroic postseason, his trade value likely will shoot through the roof with QB-needy franchises. But for Foles, the future can be put off another day. On Sunday evening, the Super Bowl MVP who once lost his love for the game relished in the adulation of his peers, a career rejuvenated and a life renewed. "I grew up in Texas. I played some Texas high school football. ... When the joy goes away, that's a hard thing," Foles explained on NFL Network. "But that journey that I went on, it strengthened me because when I was weak, I became strong. You're just blessed in this moment. We're humbled in this moment, and I'm grateful." The Philadelphia Eagles have defeated the New England Patriots to become Super Bowl champions. Check out some of the best photos and moments from the game!